Can you assume a house without any door? I guess its useless. The same thing is here with Contact Form. You can’t have a great website without a contact form. The contact form is a very common feature that a site needs to have so the user can submit their queries. In simple words, you can say that contact form on your website is the medium to interact with your potential customers. But contact forms are not the core feature of Joomla, so you need to integrate a third party extension to build your contact form on Joomla website. So today in this article, we will discuss some of the best Contact Form builders for Joomla. Convert Forms is not just a simple contact builder but you can also use it for building your email lists. You can design beautiful lead form and contact them with email marketing solutions like MailChimp, Aweber, etc. With the help of Convert Forms, you can create a simple contact form to an advanced form for your website. Even you can integrate Convert Forms with Zapier and automate your task. Easy to use & customize form builder Some fields types like Date/Time, HTML/Freetext, Country (visitor detection support), Currency, Terms of Service, etc. are only available in the pro version. Multi-type fields for inputs. Add-ons like AWeber Addon, ConvertKit Addon, HubSpot Addon, etc. are only in pro version so if you are not able to get the premium version, you can’t leverage the beauty of the Joomla Form builder. Predesigned creative Form Templates or you can create your own from scratch as well. You can connect your forms with Email marketing solutions like MailChimp, Constant Contact, etc. You can import or export the forms to use on another website. You can embed your forms on article, pages, footer, sidebar or anywhere on your website with the help of module shortcode. As the name suggests, it's an elementary contact form but more powerful and lightweight. As 90% of the contact form need only simple fields where the user can submit their few details. For that purpose, you either you need to use a heavy extension which comes with lots of features are useless for you or write your code. 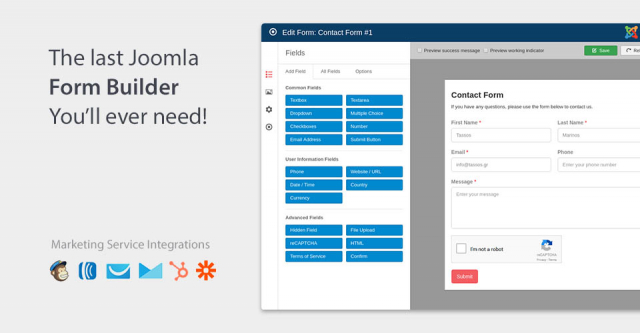 So to make it simple, JoomDev (the team behind the powerful Joomla Framework Astroid) released a lightweight and straightforward Joomla contact form builder and which is available to download for free. Fully responsive contact forms New in the market so we can expect some frequent updates from the developer. You can redirect your users to thank you page after submission It can be used only for the contact form purpose. No copyright - you even don't need to keep the credits. You can create unlimited forms. Chronoforms is a widely used Joomla contact form extension. It comes with free and premium versions so you can choose them as per your requirements. The biggest advantage of using this extension is that you can build your form with the help of drag and drop and preview the form as well. So you can have an idea, how it will look on your website. It comes with many other features like file upload, PDF creation, field validation, 2Checkout Payment integration and much more. You can run conditional actions when specific events occur, for example, you can show/hide/disable fields when a button is clicked, or a choice is made. Fully Responsive layout. It uses Semantic UI framework, so if your website is in Bootstrap, it can its UI can conflict with yours sometimes. Drag and drop form builder. It comes with lots of features and sometimes you don't need all these. So they are unnecessarily increasing your website’s weight. You can create multi-page forms. Again, if you can’t afford its premium version, you can’t experience the beauty of this extension. You can export the data in CSV format. Easy to set field validation. You can display your form in the popup. The most significant advantage that you can connect your form the Zapier as well. RS Form is the most advanced Joomla Form builder extension available on JED. With the help of RS Form, you can create a simple contact form to advanced multi-page contact form with dynamic content. 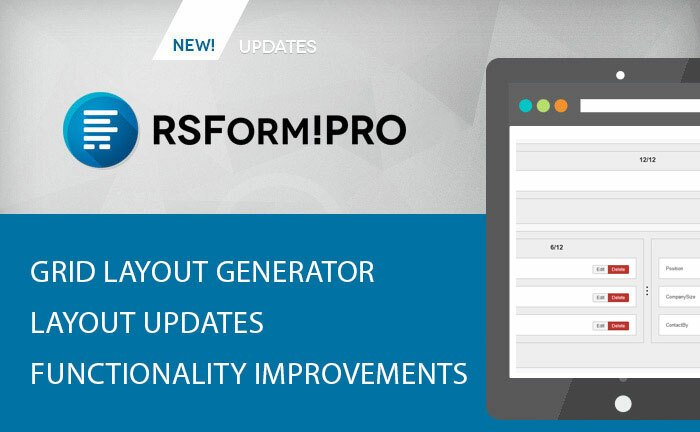 RS Form pro comes with unique feature likes exporting data in CSV, Excel, XML and PDF formats, creating multi-language forms without duplicating information and much more. The inbuilt validation rules help you to validate submitted information. It is offering all the features that you need to set up a fully GDPR ready contact form. It is easy to create GDPR ready contact forms. RS Forms comes with only Pro version. So if you are running out of the budget, you can experience it. Support CAPTCHA and reCAPTCHA. It is also a free version, but I am afraid that it is not compatible with the latest Joomla version. 20+ Integrations with other services like MailChimp, SalesForce, RSMail, etc. You can configure unlimited emails. Breezing Form is another modern Joomla extension to design simple to complex form for your Joomla website. This form Joomla component is available with both versions free and paid. You can try the free version, and if you will be satisfied and feel the need for more feature, you can give a try to its paid version. It comes with invisible captcha to fight with spam and bots, Zapier integration, Skype bots, digital signature, stripe integration and much more. Integrate your Joomla Contact form with 1000+ apps with Zapier. You can integrate Stripe with your form to receive the payments. It comes with 17 different types of field types to create even a complex form. You can directly integrate your contact form with Google Drive, MailChimp, Salesforce and other cloud services. Creative Contact Form is another powerful Joomla form generator comes with visual effects. This Joomla component comes with free and paid versions so you can give a try to its free version before purchasing the premium one. This contact form builder comes with a form creator wizard which will help you to create fantastic and responsive Joomla form for your website. It has currently 25+ creative templates which can be used as it is or you can modify them as per your needs. It has more than 116K customers across the globe who are using Creative Contact Form. It becomes more potent after version 3.0 which includes many new features, such us Creative Popup, Google ReCaptcha and much more. Flexible field types like name, email, phone, url, etc You can create only one form in the Free version. You can use the shortcode to insert form anywhere on your Joomla website You can create only upto fields in the free version. Attractive effects for Checkboxes, radio buttons, and other elements. You can not hide the backlink from the bottom of the form if you are using the free version. Multiple email recipients, BCC, reply to email, from email! It will load the countries list in your form(259 countries)! Automatically fill in Username and email if logged in! You can redirect users to a specific url after form submission. Usage of AJAX technology, to send email without page reload! You can customize the email subject. You can create unlimited forms with Pro versions. The user can set the copy of the email to himself! Even you can create multi-page contact forms as well. Shack Forms extension is developed by JoomlaShack which is a well-known name in the Joomla market. It is a powerful yet easy to use extension which helps you to create simple to the complex contact form. You can either integrate those form within the article or display in a popup or anywhere on your Joomla website. To customize or use Shack Forms you don't need to have hard coding skills. If you know little about how Joomla works, you can set up the contact form easily. It comes with drag and drop interface so you can easily add fields to your form layout. You can display your contact form even in the lightbox. There is no any free version or trial available for this form extension, so if you need to try this, you have to purchase it. No, any other option available. Show your forms as a floating slide-in box As per one user, documentation is not that much detailed. Adding fields to the form is super easy. You can easily customize the color, styles, background, effects and many others things without any code. Users can attach the files. There is no limitation to create the forms and fields. So these are the some of the best Joomla contact form extensions which can be used to design a fully functional contact form on your Joomla based website. PS: The pros and cons are based on information which is published either by the users or the developer. In some cases, it might be my own experience. So before choosing an extension, define your requirements and select only that which fulfil your needs.